Autumn is officially here! Contrary to popular belief, it didn't start on September 1st, nor will it end the day after Thanksgiving. However, it won't actually feel like fall in Southern California until we have summer, the sequel. Yes, another heatwave is coming next week that can last five days or until winter. But for now, I will eagerly await the crisp morning air, the soft afternoon sunlight, the long dark nights. Ahhh crap! I told myself last year to save up money to buy a OttLite 3-in-1 Adjustable-Height Craft Floor Lamp before it starts to get dark early. After I wipe away my tears, I'll explain why you need this luxurious necessity. OttLite makes magic lamps. "OttLite lighting is expertly engineered to bring the quality of natural daylight indoors" so you can accurately see colors any time of the day. I've lost so many hours of crocheting (and knitting...and embroidery...and sewing...) because I cannot judge which colors complement each other while under a yellowish light bulb. My mom uses a small OttLite when she paints at her desk. 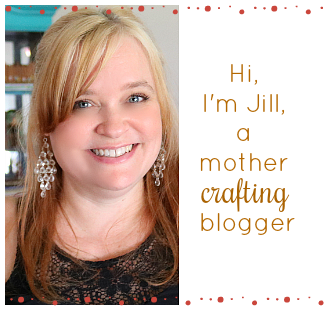 Like many of us artsy-crafty folk, she is a night owl. I asked her earlier if she liked her lamp. "Yes." She answered, but in that quiet way that translates into, "Get your own damn OttLite." Which is exactly why I'm thinking if anyone as far back as elementary school owes me money. I know all this sounds over-dramatic, but it is a big deal. Fall and winter are my favorite seasons. They are my muses. The cool weather helps me chill out mentally and become more motivated. I celebrate the end of Daylight Savings! But a huge chunk of my crafting time is compromised. Total buzzkill. If you ever put strands of yarn side-by-side creating an eye-catching color combination, you know they don't always stitch up next to one another as attractive. Determining a pleasing duo is even harder under poor lighting. In anticipation of making striped afghans and scarves over the next several months, I'm currently crocheting swatches (miniature sizes) of colorways to use. Pro-tip: add a tag identifying the yarn you used! Red Heart Yarn's Aruba Sea and Turquoise are distinguishable during the day, but at night, it's nearly impossible to tell the difference. You don't want to grab one color thinking it's something else and not realize it until morning! 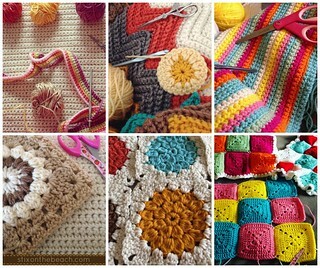 Crocheting in blocks of color is probably the safest bet! Solid color squares for blankets are the easiest! Emilia is now at the age where she enjoys playing with her doll blankets I made back when I was pregnant (bottom right corner in collage). Granny squares, sunburst, or any-type square (such as my Bibbidi Bobbledee Baby Blanket partly shown in bottom center in collage) worked in rounds in an assembly line fashion can also be super productive. Start by making up a bunch of center rounds at night, then choose your color for the next round during the day. Repeat for each round until complete! You can also choose 3-4 colors that look fab no matter the orientation to one another and just be random in picking 'em at night. That's what I'm basically doing with my scraps of brown & cream tones (bottom left corner in collage). So there you go! Light 'em if you got 'em! But if not, try these ideas. I can see how they could be altered for embroidery and sewing projects too! Share with me in comments what things you find fun in the fall!